Born in 1984 in Kerboran (Dargeçit) in the province of Mêrdîn (Mardin), he graduated from the Department of Primary School Education at the Kocaeli University and taught at schools in the towns of Derik, Çınar and Sur for nearly eight years. In the same period, he completed his master’s degree in the Department of Kurdish Language and Culture at Mardin Artuklu University. His master’s degree was titled “Di Romanên Kurdî De Temaya Sirgûnê” (The Theme of Exile in Kurdish Novels). He is currently writing his PhD thesis, titled “Di Wêjeya Modern a Kurdî De Temsîla Kêmareyên Nemisilman” (The Representation of Non-Muslim Minorities in Kurdish Novels), at the University of Essen-Duisburg. 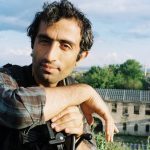 Yeşîlmen has been writing critical reviews and research articles about Kurdish literature since his university years as well as doing translations. Between 2003 and 2006, he was a member of the editorial board for the magazine Amigra and has been editor of the magazine Wêje û Rexne since 2014. Additionally, he is one of the founders of the Diyarbakir Reading Club. He has published in magazines such as Amigra, Tîroj, Çirûsk and Wêje û Rexne. Yeşîlmen is married, has one son, and currently lives in the city of Essen in Germany.